At this point, I am sure that all of you have heard of New Belgium Brewing Company. They are the brewery that makes Fat Tire, the beer that launched these guys to new heights. Well, don’t let that fact fool you one bit. New Belgium makes some damn fine craft beers, especially with their Lips of Faith Series and other seasonal beers. Here we have their Summer seasonal beer, Rolle Bolle, a Belgian Pale Ale brewed with monk fruit and soursop. Interested choices in fruits to use. I have never actually had these fruits on their own, so I don’t know exactly what they taste like. I poured this beer into a tulip style glass. The beer poured a slightly hazy bright yellow color with a two finger wide foamy white head. There was a good amount of carbonation bubbles leaving the head throughout the session, leaving a good amount of sticky lacing down the glass. The aroma is floral, a bit herbal mixed with a lot of citrus and berry like fruit flavors. Reminds me of a botanical garden or something. There is an underlining of malt and yeast aromas present as well, peppery and bread-like. Just the smell alone is Summer in a bottle! Taste definitely follows the nose with a mild fruit profile of citrus and berries followed by a peppery bread taste. 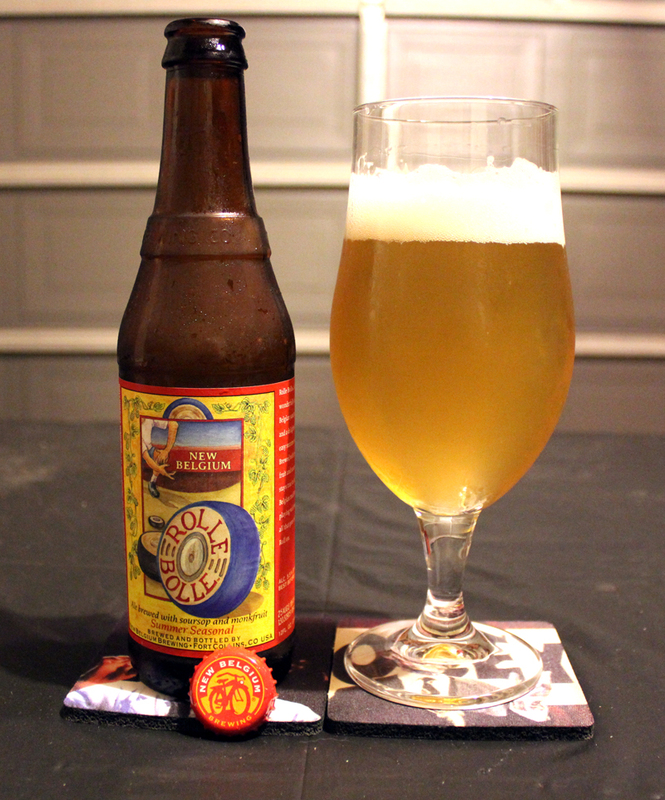 There is a tiny bit of sour tartness to this beer, but not much to drive you away from it. I’m sure this is from the use of the use of the Soursop which is said to have a sour citrus flavor. Right amount of bitterness as well. This beer is definitely one I would drink again. The body is light to medium with a clean, crisp bite, and a bit of creaminess as it goes down. Overall, I will say that this is a perfect Summer beer. Good to drink this on a hot Summer day outside while grilling, laying in a pool or even at the beach. I guess the next ttime I go visit the coast, I will have to stop and pick me up a six pack of this fine beverage. Metal Connection: I had asked my fiance about this one first, and right away she thought of the song “Rocka Rolla” by Judas Priest, cause of the name of the beer. She said the name Rolle Bolle reminded her of the song title. I could see that. Good Job in helping me pick a song! Seems the Metal is flowing in her veins as well. I found me a Rocka Rolla girl for this Rocka Rolla man, BeerMetalDude!